Atletico Madrid are in need of strengthening their attack and Raul Jimenez may be the last piece Simeone needs for his new look attack. 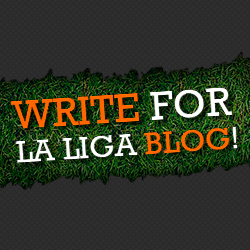 The departures of Diego Costa and Adrian Lopez this off season have left Atletico without two key attacking players that played a vital role in their La Liga championship run. Simeone has already signed Mario Mandzukic from Bayern Munich and Antoine Griezmann from Real Sociedad to supplement his team’s attack. Both players are great signings and no doubt will provide goals all throughout the season. 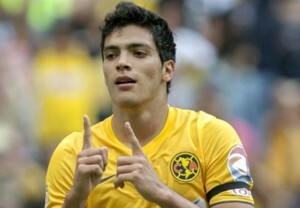 ‘El Cholo’ is looking to add one more striker to the fold and he goes by the name of Raul Jimenez. Raul Jimenez, a rare product of Club America’s youth system, has just signed a contract for the biggest move of his career. Atletico Madrid have just confirmed the signing of the 23 year-old Mexican striker that participated with Mexico at this summer’s World Cup in Brazil. Jimenez will sign a six year deal and the fee is reported at 14 million USD, approximately 11 million Euros. Jimenez is a player that impressed Simeone in a pre-season friendly between his club, Club America, and Simeone’s Atletico Madrid. Jimenez is a natural number ‘9’, but his game is so much more. He is a very technical player with good ball control and some decent hold up play. He knows how to find the right spaces in the last third to set himself up for an opportunity or a team-mate as well. Jimenez is also a strong player that’s got some decent pace on him as well. He is also very mobile in the final third and is strong in the air. Jimenez is also a winner. At 23 years-old he has to his name an Olympic gold medal from 2012, a Toulon Tournament winner’s medal, and one Liga MX title with Club America. It should also be noted that he’s a Mexican striker that came through the ranks at Club America. Club America is always known for having foreigners as strikers and have typically not given a chance to a youth system product to lead the line since I can remember. That’s what makes Jimenez a rare product. Jimenez isn’t a household name, but fans may know him as the young striker that saved Mexico’s World Cup hopes with a stunning ‘chilena’ or bicycle kick. He’s not afraid to try the difficult shots and he’s been successful with a few. Upon arrival, Jimenez will have tough competition for the starting spot, but ‘Cholo’ is bringing him to the squad knowing that he is good enough for the starting spot. Jimenez’s main rival is Mandzukic, who in his own right is a lethal striker and also strong in the air. I feel Mandzukic might get the nod over Jimenez solely based off of European experience and the fact that he’s got experience at a big club coming from Bayern Munich. Neither striker can rest on their laurels though. The fact that they are both new to the club means that neither has an edge over the other in ‘El Cholo’s eyes. ‘Cholo’ praised him after playing against him, and Mohamed, Club America coach and good friend of Simeone, recommended Jimenez to him. Jimenez has the tools to succeed at Atletico as long as he adapts to the life, style of play of Simeone, and maintains patience. I believe he will make most of his appearances in the Copa Del Rey games and in the Champions League. Atletico have made a solid signing in Jimenez and thrive I know he will.